Heat Panini grill to high setting. Spread one slice of sourdough bread with 1 tablespoon cherry mayonnaise. Layer with 2 apple slices, 4 oz. roasted turkey breast, 1 tablespoon cherry mayonnaise and 2 slices of Brie cheese. Top with bread slice; spray with cooking spray. Place oiled side of bread on heated Panini grill; spray top of bread with cooking spray. 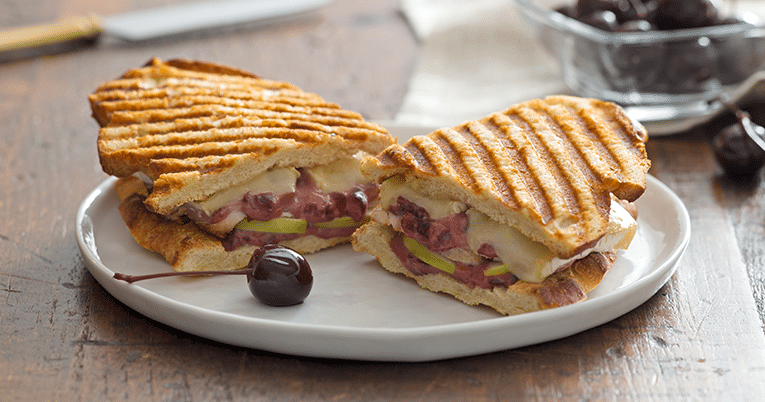 Close Panini press; cook until bread is lightly browned and cheese is melted. Cut in half and serve. Combine the drained cherries with the mayonnaise, orange juice and orange zest.